I think I’m going to throw a change-up at you folks today. I’ve been contemplating an article about this topic for quite a while but, finally decided that now is the time to do it. Instead of my normal pitching routine where I ramble on about something, I want to give all of you a different perspective on things in the softball world. My pitching school business is booming right now. It’s hard to ever imagine any business saying they are “too busy” but, I’m almost to that point. Don’t get me wrong, I’m not complaining! I’m very blessed and very fortunate. However, if there is one thing that really saddens me about doing what I do for a living, it’s that there are NO boys in any of my clinics or pitching classes. Let me preface this by saying, I’m 32 years old. Born and raised here in Erie PA. And I have NEVER played a game of baseball in my life. Never. Not once. Never even tried out for a team. This makes me a bit abnormal. I got my start in softball through being the batboy on my dad’s teams. We would play catch and I’d imitate all the pitchers, and basically I never stopped. In a nutshell, that’s how I got started. I kept progressing and progressing in my pitching and finally even got invited to the boy’s 18-under National tournament when I was 15. But, this all happened long before Women’s softball was in the Olympics. Back then, men’s and women’s softball (including boys and girls) was somewhat equal in the eyes of the ASA. But, that’s all changed now! It seems today that the ASA is more bothered by being in charge of men’s fastpitch softball then they are willing to do anything for it. Now, before I continue, let me say this: I applaud the USA Women’s team. They represent our country as well, if not better, than any other sport at the Olympics. Moreover, their success is unparalleled! So, they deserve EVERY accolade coming to them and as a member of the US Softball program, I couldn’t be more proud of them. In terms of their success, one could even make the argument they are still under funded considering all they do for the sport, both here and abroad. When I do clinics around the country, things usually begin with the host introducing me. While the parents seem eager to learn and hear me out, the girls sit there (bored as hell) thinking this is just another moron who’s going to talk to us about pitching. The host usually gives a brief background about me with my playing experience and coaching history. Meanwhile, the girls are still starring off into space. It’s at this time; I get a volunteer from the audience and throw some pitches. As I begin throwing harder and harder, the girl’s eyeballs grow with disbelief. However, I’m not sure they are “impressed” by me or just amazed that I’m actually pitching softball! Yes, the USA has a men’s team. However, without men’s softball being an Olympic Sport, the ASA/USA softball program would rather think of us as that dirty old uncle that the family never talks about. And, I don’t want to be misunderstood here. I’m not implying that the men’s team should get the same “perks” as the women’s. Far from it. The women’s team has earned their status in the sport and they deserve the spoils. But, isn’t it sad that the USA’s governing body of the sport BARELY even recognizes the other half? Let me site an example. When the IOC purposed the elimination from softball after the 2008 Beijing games, it prompted a fury from the softball world. But, did you know that Brazil is trying to oust Men’s softball from the upcoming Pan Am games in 2007? That isn’t something anyone wants to report or discuss. Brazil is hosting the ’07 Pan Ams but, does not want any Non-Olympic sports in there. I guess it doesn’t matter that when they bid to host the games, men’s softball was included. Now they want to change the rules. I’m sure there are other non-Olympic sports on the bubble of being cut too. But it’s ironic to me that the ASA/USA hasn’t made this public to garner support from the public. But, the impact of men’s softball is being felt in the women’s game today more and more. Kyle Magnusson (University of Utah), Ehren Earlywhine (Georgia Tech), Ken Eriksen (U of South Florida), and Shawn Rychcik (Boston University) are just a couple of former Team USA men’s players who are now coaching at the college and Olympic level. Moreover, other schools such as Bowling Green University in Ohio have hired Kyle Jamison as their pitching coach. 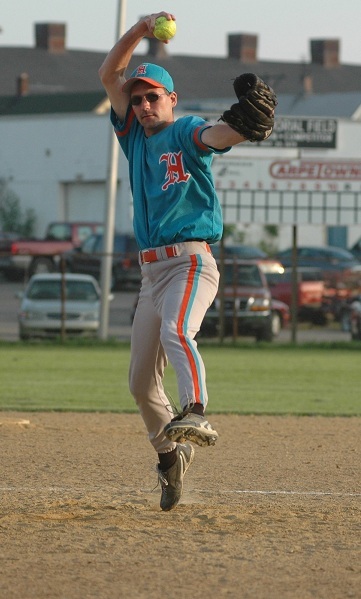 Kyle is a Canadian born pitcher with some international experience. Simon Roskvist, who was the Aussie women’s coach for many years, including the ’04 Olympics is formerly from New Zealand and was a great pitcher in his day. And the new Aussie coach, Fabian Barlow is another former New Zealand National team player who’s worked his way into the women’s game. I’m sure there are many others but, this just illustrates a few examples. All of these guys are ones I’ve played with and against over the years, throughout the world. Gone are the days when the men’s softball leagues were in every town. Ironically, there aren’t many places around the country for women to play when their college careers are done. This has always baffled me. Softball is a huge part of a young girl’s life from the time they are 10 until they’re 21 or so. It’s hard to believe they don’t have more leagues for them to play in during the summer. I know there are some HORRIBLE high school rules which prohibit summer league softball in some areas and have some unbelievable restrictions. So, I can only imagine what kind of rules the NCAA must have! I think for softball to continue it’s worldwide success; it would behoove us to keep it alive for both genders. While it’s a pipedream, I’d like to see ASA/USA throw just a little extra support towards the men’s side of things. Again, I’m in no way implying we should get equal funding or support as the women but, if people understood the disparity between the 2 programs it might be easier to understand why the men’s game has almost fallen completely off the Earth!